Along with about 2000(est) socially conscious, proud men and women I braved the scorcher of a day Sunday, June 27th, 2010 to attend Virginia's largest gay pride event, Out in the Park. I did not get to the park as early as most, the board members having been there since before 11 that morning. - and from what i was told the major swell of the crowd was midday through about 3, it was after 4 when i arrived at the Chesapeake City Park to find about 500 people still enjoying the day and celebrating their 'cultural' heritage. Already entertainment such as the music of local band Ffelt, and GLBT Omni Media Group's friend, singer Narissa Bond, had taken the stage inspiring the crowd with music and song. A 20 year veteran of the now 22nd year annual event, performer and hostess, Diana Ross, emcee of the pride celebration, kept the crowds entertained between sets and introduced the speakers and acts with her legendary warmth and love. Acts from local drag performer Naomi Black, the lesbian community's Drag King of Pride Josh Logan and first runner up Mitch Riley entertained between sets from bands such as UnderCurrent and Calypso Nuts while Park guests enjoyed the afternoon's festivities and activities. The first sites I saw were the numerous vendors that had contributed to the event by showing their support of our community. 55 businesses, restaurants, clubs, groups, and public service organizations had donated to the event and set up tents in the great lawn this year. I had the pleasure to stop in and visit many of the represented local businesses. Everything from memorabilia, art, summer wear, services and souvenirs filled tents and the friendly faces representing area merchants welcomed the opportunity to engage the GLBT community. Aromas of tasty carnival treats wafted through the summer air inspiring festive feelings and made for a jubilant atmosphere. I caught up with my good friend and HR Pride board member Patrice Gant at the W.E.T. (Women Engaging in Talk) tent and was introduced to the groups CEO Megan Boone, who was so good to give an interview to former TOGETHERVA.com staffer Steve B. (check out W.E.T. 's message by clicking on the clip in the column to your right 'W.E.T.' ) Patrice and the women of W.E.T. showed their pride, celebrated their womanhood and represented the lesbian community, with dignity and eloquence. Next door to the women of W.E.T I found my new friend John Childers and a couple of friendly faces representing Hampton's St. Marks Church. The group was offering park visitors an invitation to the spiritual haven that is truly accepting and open to all. John Childers also happens to be one of the organizers of the first ever city sponsored Pride Events in the state of Virginia, The Hampton event, The Diversity and Pride Festival, which held its first event the week before in The City of Hampton's Mill Point Park was attended by 400+ (est.) people. John, seeing I was already exhausted and suffering in the heat, being the good christian fellow he is, offered me a seat in the shade of their tent and some cool water. Resting in the St Mark's tent I had a chance to catch up with him about the Hampton event. Although I was unable to attend I heard all about the celebration from our W4WLIFE.com June Feature, Shannon Foy who along with GLBTOMG friends Patrice Gant, David Rourke, Mitchell Howe and Chris Robinson who all attended the historic event. John also spoke with me about the church. St Marks sounded like a wonderful place and I do hope one day soon to have the opportunity to attend a service or one of the many functions the church sponsors throughout the year. The sit down with John and refreshing cool water having revived me some, along with the sounds of Seed Is... from the stage inspiring me some, had me feeling well enough to explore a little more. I had been waiting eagerly for weeks now to see one exhibit in particular and was heading over to check out the Gay History tent when good friend Mike Wesely, Gay Mayor (unofficial) caught up with me. Mike, one half of promotions and networking phenomenon Mike -n- Mark (partner Mark Hinkley) was all smiles enjoying the revelry and atmosphere. Just the previous night Mike -n- Mark hosted the Mike Thomas Presents and GLBT Omni Media Group sponsored Oceanview Pier Party II benefiting HRMC (Hampton Roads Mens Chorus). Mike and I shared comments on how great it was to see so much support and love in the community. HRBOR president, Nicole Carry, joined us and shared in the recognition of hope that the day represented. HRBOR, one of the events sponsors along with EV, Klub Ambush, The Rainbow Cactus, and New Life MCC is an example of what a community can accomplish when working together. Another great friend and absolutely the world's greatest mom, Rhona Hyman, GLBTOMG's very own Brandon Hyman's mum, joined us in our observations of the event. Rhona, aspiring actress and comedienne, commented on how wonderful it was that in our small repressed area and in record heat, no less, there was an incredible turn out. And it is incredible, a sign of hope; the numbers are here, the voices are being heard, the message is being shared... the time is coming that a truly free, equal rights for all, united and stronger for it America is within our sights. The struggle to end oppression is not new to this country, it is the sad legacy of this great nation that oppression has been part the American experience since the first settlers arrived seeking freedom from religious persecution. Up through the struggles of various immigrating ethnic groups, nationalities, faiths, women, Native Americans and most recently the African American's fight for civil rights, the history of America is one example after another of the plight of the underdog, the shunned and the ostracized gaining their equality and earning their rights through respectfully representing themselves en masse. Despite the sad truth that America is still today in 2010 not equal for all, nor free for all, I like to think that the greatness of America has been built from the courage of those shunned and ostracized underdogs who stood up and made their presence known, involving themselves, offering themselves and proudly representing themselves to their fellow citizens to achieve equal rights once denied them. Out in the Park is just one day and just one way our community is making known our presence, as we involve ourselves in the communities beyond our own we continue to gain recognition for our cause. Offering the chance for fellow Americans to know us and understand we are no different than themselves we can make the difference in their hearts, minds and votes to see equality is not for some but for all. The recognition of our community has been slow and the road to equality has been wrought with tragedy and hardships but our history is not without its highlights and victories. Showcasing the legacy of our GLBT community's strength and perseverance, The GLBT History Project, sponsored by Hampton Roads' Pride, tells of the men, women and events that have brought us thus far in our journey for equality. Project coordinator and former HR Pride board member, Patrick Bradley (Treasurer 2008-2010) has assembled a collection of stories, articles and profiles of the area's GLBT community and the brave champions that have made possible the opportunity for us today to congregate openly and without fear so we may collectively call on the nation to recognize the injustice and inequality oppressing our community. Meeting up with local celebrity, community icon Jennifer Warner in the History Project tent I got a first hand lesson from Jennifer on the changing times and changing minds of the Hampton Roads area. Jennifer has been a figure in the community since the 80s and has not only seen the changes but has been a force behind them. Speaking up for any cause takes bravery, speaking up for the GLBT community in an area that is known as the buckle of the bible belt is down right heroic. Jennifer Warner had begun a career that has taken her all over the country and world right from here in Hampton Roads. In the backyard of christian conservative stronghold Regent University and home to anti-gay religious idol and university's founder, Pat Robertson, Jennifer Warner has shown like a beacon for the community. As an entertainer who challenges the mainstream norm and lives openly and proudly a supporter of the GLBT community, Jennifer has been a source of inspiration to countless men and women who have struggled with their place in the world. She has given her fans the courage to be themselves by being herself and showing that no matter what persuasion, orientation or gender one may be there is a place for them in this world. Jennifer made her way through the tented exhibit pointing out events and moments that she was part of, telling the story of many of the men and women who have come through or from here from first hand experience. She proudly showed the progression she has been so very much a part of and a party to with humour and love. Jennifer, herself battling cancer, braved the heat to make an appearance to this year's event for her fans, to show her support and continue her epic and heroic journey as an inspiration to the GLBT public. Board members Larry Sauger, also of the leather lifestyle group, Knight Hawks of Virginia, and Dana Miller, HR Pride Volunteer Cooordinator, along with Treasurer, Randy Hobbs, manned the exhibit, welcoming guests and pointing out interesting articles and features to interested patrons. The exhibit is a continuing feature of pride's Out in the Park and I do hope it becomes a fixture that year after year grows with the community and keeps alive our community's legacy. From the History Project tent I traversed the lawn and joined the crowd at the main stage for the awards presentation. Every year a number of awards and recognitions are given to members of the community who have through action and example made a difference and contributed to the community in an extraordinary way. HR Pride's Community Service Award was presented to Annette Stone, a major benefactor and supporter of Pride and the community. Ms. Stone, owner of many GLBT friendly establishments such as the Hershee Bar, The Boot, a Dining Out for Life, participant, and area eateries The Green Onion and 37th and Zen, has opened her establishments to support the community and has contributed financially to many GLBT causes. After having done so much to make Out in the Park possible, Annette was unable to attend this year's event but was acknowledged for her contributions with great applause and an award of appreciation from HR Pride. The Bob Lewis and HR Pride's scholarships, a Hampton Roads Pride legacy and community service, were also presented. The fund is awarded to college bound and university students active in the community. Recipients of the fund are chosen for their merit and scholastic achievement and awarded a cash contribution to their future educational endeavors. This year GLBTOMG has joined with HR Pride in the promotion of these fine young men and women by starting the Teej Beck Fund for Education. Presenting Pride with a check of $500 to refill the coffers of the scholarship fund for the coming year, former TOGETHERVA.com managing editor, SB announced our company's promise to continue the tradition annually. This years recipient of the Bob Lewis Scholarship fund was Nico Loren (Nikki Ross) and awarded the 2010 Pride Scholarship to Abigail Marshall, both of whom attend university locally. Two very deserving people who we know will pursue and accomplish great things. Hampton Roads Pride secretary, Shannon Foy, GLBTOMG's W4WLIFE.com feature story June 2010, walked the park with me taking in the sights and greeting people. Shannon, just in her first months as the organizations secretary, shines in her role as a representative of the community. I was so impressed with all of the members of the HR Pride Board who were in attendance and also volunteers such as Michael Roland, who's dedication to this year's event has been unparalleled. Michael was recognize with the 2010 Commitment to Service award for his efforts and service to the community. Truly remarkable men and women have made possible the opportunity for the community to come together with such an event and we are fortunate to have such passionate and involved individuals dedicated to the cause. James Parker, second term Hampton Roads Pride President and perhaps one of the most active members in the community, presided over the entirety of this years event from the very beginning. Juggling responsibilities of a nursing career, a position on HRBOR's board, a drag entertainment 'family' and a relationship, James amazingly managed to put together an event on the scale of Out in the Park with limited budget, resources and outside assistance. With the experience of having already produced two, and to date the most attended, Out in the Park events, James managed the day with relative ease and great success. After a grueling several days of last minute preparations, James proudly took the stage, looking no worse for wear for all he has been through the past weeks, he gave thanks and acknowledgment to all of the participants, performers, volunteers and patrons for their part in making the day an enormous success. James, along with the eleven other board members of Hampton Roads Pride succeeded in their mission to Instill Pride, Celebrate Unity, and Embrace Diversity in the GLBT community of Hampton Roads and in southeast Virginia. Truth be told if it had not been for the tragic events those early morning hours of June 28th 1969 our GLBT community today may have never come to know the other meaning of PRIDE. Pride the proper sense of one's own value: the correct level of respect for the importance and value of your personal character, life, efforts, or achievements. Neither vanity nor arrogance motivated the voice of the community that morning at the Stonewall Inn (NYC) but simply a resolve that no longer would intolerance be tolerated and the basic human requirement of respect would honored. Years of oppression and subjection to ridicule, torment and abuse did not break the GLBT community's spirit but inspired those beaten but not broken to do something to put an end to the oppression. The first years following the riots at The Stonewall, the anniversary was marked with vigils and marches of remembrance and protest in major cities around the country. A call to the community to organize and unite against social injustice was sounded and the community rose to the challenge of fighting intolerance, inequality and injustice. Forty years later today's Pride events bear little resemblance to those first marches. Celebration has replaced protest and the community now gathers to rejoice in our unique culture. As it was related to me, twenty two years ago in Hampton Roads the very first organized Pride celebration took place in Virginia Beach's Mount Trashmore Park when a group of no more than 50 gathered to enjoy the camaraderie and freedom of living out and proud. There was no protest, no political statement, no demonstration simply a gathering of like minded individuals who wished to celebrate their lives, efforts and achievements. The Pride celebrations here in the Hampton Roads Virginia may have had a slow start but have since steadily grown as the fear of social ostracization that had kept a great many from the first event has met with acceptance and tolerance. Just as the first gathering reflected the indomitable spirit of the brave GLBT community here in Hampton Roads today's celebrations reflect the great efforts of the community to integrate participate and educate. 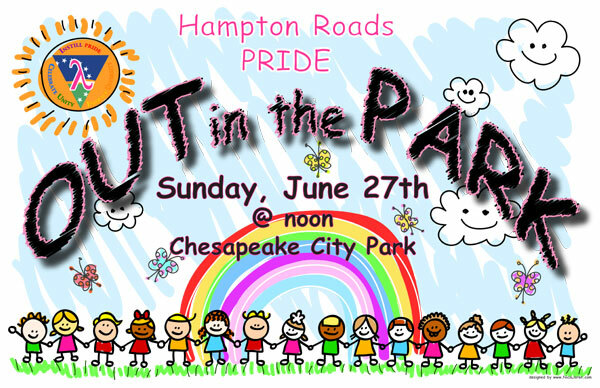 Today Hampton Roads Pride Organization's event Out in the Park welcomes as many as 7000 guests annually. The efforts of the HRP Board to encourage the community to participate are evident. The growing participation is a sign that Hampton Roads is a coming out of the closet and celebrating a rich diverse community. The HRP board has to date never been properly introduced to you Hampton Roads and so we would like to take this opportunity to make the introductions. These are men and women just like you with jobs and obligations and responsibilities who have chosen to volunteer their time and energy to producing an event where everyone can feel accepted and welcome. So if you see them out and about do say hello and thank you. Let them know you support them and appreciate all that they do. James Parker, President. I have lived here in the Hampton Roads area since June of 2001 while stationed here as a nuclear submarine mechanic. Originally from California, I decided to stay in Virginia after being discharged from the military due to Don’t Ask, Don’t Tell. After my discharge, I went to school to fulfill a life-long dream of becoming a nurse and graduated as an LPN in August of 2007. I also spent more time on my other passion, my life as an entertainer. As my alter ego, Faith Devereaux Warner, I am a former Queen of Hampton Roads Pride (2007-2008). This is what started my involvement with HR Pride. I began working with Pride because I was a drag queen, but continued my involvement with Pride because of the amazing works that this organization has done and can continue to do. My involvement with Pride grew and I became the President in April of 2008. Through my involvement with Pride, I began to reach out to other organizations to continue Pride’s work. My plans since joining the board have been drastically changed for the better with my upcoming marriage and plans to finish my RN. I plan to finish my second term as President of Pride and teach the future leaders of our community how to continue the work of Pride for many years to come. Jamie Leigh Ormsby, Vice-President. Our Board of Directors is truly a diverse group that reflects the entire GLBT community, of which, I am the transgender representative. I’ve lived in Virginia Beach for the last 32 years, where I’ve raised three sons. I love the quality of life; Hampton Roads has given to both me and my children. I am a retired government employee and one of the first in a managerial position to transition during active employment. In the past, I was a performer (aka, Jamie Leigh Michaels) and promoter/judge of female impersonator pageants, both local and national. In the early 1990’s, I co-founded “Christmas for the Children of Candii House”, which raised monies for pediatric AIDS patients. I’ve been invited and participated in Transgender lectures at both Old Dominion University and Virginia Wesleyan College. I’ve also been privileged to play and coach in WUSA (Women’s United Softball Association) and play in the UPL (United Pool League), in Norfolk. Shannon Foy, Secretary. I am a kindergarten teacher, singer, writer, conversationalist, activist, and humanitarian. My passion in life is to put a smile on the lives that I touch. As an openly gay African American female, I find it hard to bridge the gap between my community as a gay woman and my community as a member of society. Life as you know is hard enough. When we add certain labels to us, it then becomes even harder to blend into two worlds. My goal is to make sure that all lesbians, like me, feel comfortable in their own skin no matter where they are. I feel as an African American, educated, dedicated, compassionate, and loyal member of society, that it is my duty to make sure that the awareness of both worlds are bridged. When I look at going to work each and every day I can see the ignorance of my fellow colleagues. It is strictly because they don't understand that we are humans just like them. I am a representation of the African American Lesbian females in Hampton Roads. I am not the end all to be all, but I am a member of this community who wants change. I have a Bachelors Degree in Communications from Virginia State University. I have a drive and determination to learn something new each and every day. I currently am in pursuit of my Masters Degree in Special Education. I have the desire to make a change in people’s lives. My goal is to show my neighbors, city, community, family and friends, that an African American educated lesbian woman can be successful. I am not here to take over. I am here to offer you a voice. A way into the minds and hearts of people who are just like me, but may not have that outlet to say what is on their minds. The road to my self discovery wasn't very easy. I came from a drug addicted mother who could barely keep a job. I was moved around from state to state not knowing which way is up. I began to see the different ways that people looked at gays in general. The bigger cities are a lot more accepting of our “lifestyle” but not everyone has a liberal mind. I began to realize at a young age that I had an attraction to woman. I could see the look in the eyes of the congregation at church whenever the preacher would talk about homosexuality. It made me a little uncomfortable, but never afraid to stand up for what I wanted. I came out at the age of 14 and from that day on I never took a look back at this so called “straight” world. I must say that being the person that I am, I never got the weird looks from people as I walked down the street. I have always been upfront and honest about who Shannon Nicole Foy was and is. When I decided to become a teacher I knew I was going to be faced with challenges as being a lesbian woman. I decided not to let that stop me. Let me remind you that being a lesbian woman is only a small part of who I am. It doesn't define my ability to teach a child, love my school, or anything else that I decide to do with my life. It only is my choice on who I love and want to spend my life with behind closed doors. I hope that you can see in my few short words my true dedication for equality for all mankind, human kind, however we opt to say the human race. Randy Hobbs, Treasurer. Born in Elizabeth City, North Carolina, I moved to Virginia Beach in 1986 and have lived in the Tidewater area ever science. I have a degree in Business Administration and a second degree in Computer Science. I currently live in the Lafayette area of Norfolk and work in Chesapeake at The Hartley Law Group. I am the music director at a church in Virginia Beach and have been active in the community for as long as I have lived in the area. Dana Miller, Board Member. I was born and raised in North Carolina as a Southern Baptist who ran beauty pageants when I was a child. I sang in the church choir growing up and as a teen in the local show choir and for weddings and funerals. I moved to Hampton Roads 11 years ago because of the military and decided to stay here because of love. I currently sing The National anthem for military ceremonies and events. I love to read, sing and fellowship with friends. I am engaged to my lovely fiancé, Angie Munden. We live in Virginia Beach with our wonderful dog, Amber. I am a Psychology major finishing up at TCC and plan on transferring to ODU in the fall, with the ultimate goal of obtaining my doctorate in psychology. I then plan opening a women and children's mental health clinic because I feel I can be of best service to these groups with my life experiences with GLBT issues, domestic violence (my father murdered my mother when I was 13), divorce (was married to an alcoholic because I thought it my mo ral obligation to marry a man and divorced after 8 years) the military life and many of the other struggles women and children face. I've always been active in the community as a whole from charity 5ks to 1/2 marathons to working for the food bank and Special Olympics, as well as 5 years of team captain for the MS society walk. My latest passion is the Samaritan House I collect clothes, household items, toys and books and make drop offs to the local shelter to help those in need of escaping domestic violence. I got involved with Pride because of a friend, who was a former board member, knew I wanted to get involved and suggested I come to the meetings. So I went to my first meeting and immediately went to work as the Volunteer Coordinator and was later elected to the Board. I continue working towards equal rights for all people in our community, as that is the goal of Hampton Roads Pride. Larry Sauger, Board Member. I grew up in an Army family and spent my life moving all over the country and world. I was born in Augsburg Germany but have always considered Washington DC and Buffalo NY home until I moved to Hampton Roads for a job 3 years ago. I have been in the travel industry for the past 24 years and have always tried to find ways to help in the community I am a part of. I am currently an officer with the Knight Hawks of Virginia, the Hampton Roads Gay Leather Organization and joined pride to become a link between the Leather Community and the rest of the GLBT Community here in Hampton Roads. Jack Gregory, Board Member. I was born and raised on the Outer Banks of North Carolina in the town of Manteo. I have always been a frequent visitor to the Virginia Beach and surrounding areas, residing here for 2 1/2 yrs until I moved back to the OBX to assume a position with a company there. I still keep a residence in Virginia Beach, where I still reside several days a week. I have one son, 25, who resides in Austin TX with his fiancé. I have been in sales most of my career, and find fulfillment helping others in the GLBT community, which lead to my involvement 3yrs ago, when I joined HRP and the board of directors. Active in pride events, this year will be the third year that in addition to other events; I will be running the beer garden at "Out in the Park", as well as fundraisers and pageants. I was also one of the judges for the HRP King pageant, the Queen pageant, and attend all fundraisers I can to help raise money for the GLBT community to help increase awareness, educate, and involve other GLBT residents in the area to be involved. I believe that equality belongs to us all, and we have to work to achieve it in any way we can, starting with family, workplace, community, and am also an advocate to repeal the “Don’t Ask, Don’t Tell” amendment for our military and an advocate for gay marriage and rights. Patrice Gantt, Board Member. Courage is the most important of all the virtues, because without courage you can't practice any other virtue consistently. You can practice any virtue erratically, but nothing consistently without courage. My name is Patrice Gantt and these are the words that I live by each and every day. As a woman of color, courage is one thing that you have to have to survive this cruel world. I am an 8th grade special education teacher who resides in Hampton, Virginia. Living an openly gay lifestyle, I must say takes a lot of courage. It’s not a badge of honor that I walk around wearing each day, it is just who I am. My passion and dedication for making a change in the African American and LGBT community grows stronger each day. I want to be a positive representation of what a woman of color truly represents. I am a teacher, lover, friend, advocate, and member of Hampton Roads Pride. I came into this organization to make a positive change in the gay community as well as the African American gay community. I hold a Bachelor of Science Degree in Communicative Sciences and Disorders from one of the most prestigious Historically Black Colleges Hampton University. I have two Masters Degrees in Speech Therapy and Special Education. I have overcome some of the most difficult odds growing up in Baltimore, MD being a woman, a woman of color, a lesbian, and a member of society has posed many obstacles along the way. With continued dedication to serve my community I will be the best representative that I can be. I can only be one person and that is Patrice Gantt. I hope that you can see that you can do anything if you set your mind to it. Let me just give you a quick reminder that being a lesbian by no means defines who I am as a person. It doesn't change my ability to teach my children or make a difference in this world. I work hard each and every day to make a difference and I will show you all that I can and will do. Tim Welborn, Board Member, Former President. Tim is a graduate of Bayside High School, Lee University in Cleveland, TN, and has completed additional studies at Old Dominion University. He holds a Bachelor of Arts in Sociology. Because of his work with Hampton Roads Pride, he became good friends with Bob Lewis who happened to be best friends with the Executive Director of the Tidewater AIDS Community Taskforce. He had the wonderful opportunity to do an internship with TACT as a case manager and was eventually hired by TACT. In 2008, Tim was promoted to Director of Education of The AIDS Fund, formerly known as TACT, where he has been serving ever since. Tim currently lives in Norfolk, VA and is a proud parent to two wonderful babies, Pogo and Piper. He enjoys spending time with family and friends and is happy to be serving with HRP again. Chris Downing, Board Member. 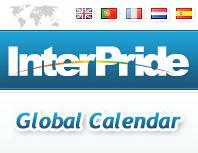 In addition to my board duties, I maintain the Hampton Roads Pride website. I'm a Hampton Roads native, raised in Virginia Beach and for the past ten years have called historic Olde Towne Portsmouth home. By day, I work a retail job with OfficeMax and on the side I am a freelance photographer, costume designer and jeweler. When the sun goes down, some of you may know me by my stage name Sydney Devereaux, the hair-slinging (and hair losing) female impersonator.